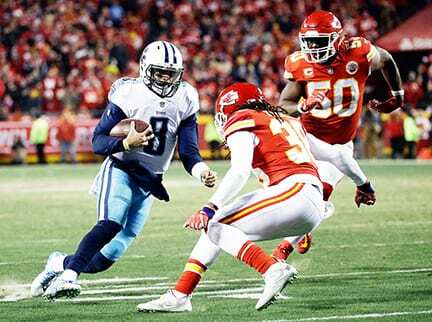 The Tennessee Titans made a remarkable second half comeback Sunday, erasing an 18-point halftime deficit on the way to a 22-21 first round road victory over the Kansas City Chiefs in the first game of the 2018 NFL playoffs. Marcus Mariota had two touchdown passes and one touchdown catch of a deflection, passing for 205 yards and sparking an incredible rally for a team that looked totally defeated and confused through the first 30 minutes. Derrick Henry also had a career-high 156 yards rushing and a critical touchdown run, while the defense that was scorched for 18 first half points totally shut out the Chiefs in the second half. It was Kansas City’s sixth straight home playoff loss, an NFL record. They haven’t won a home playoff game since 1994. It was the Titans first playoff win in 14 years, and it also obliterated pre-game speculation that Titans head coach Mike Mularkey’s job was in jeopardy. Titans’ ownership came out Sunday saying there was no question he would be back next season. The Titans did benefit from some questionable calls, particularly one that came with 1:47 remaining. It looked like Henry had fumbled and Derrick Johnson had scooped it up and run for a touchdown, but the play was blown dead after replay. The Titans’ turnaround, which climaxed with a 22-yard touchdown pass to Eric Decker, seemed improbable after a first half that saw Alex Smith complete 19 of 23 passes for 231 yards. Kareem Hunt had a one-yard touchdown run, and Travis Kelce a 13-yard touchdown pass, followed by another Smith touchdown pass to Demarcus Robinson right at the halftime break, making it 21-3. But then the defense shut the door on the Chiefs. Not only did Mariota catch a deflection for a touchdown, the Titans shut down both Hill and Hunt. Kelce was knocked out of the game in the second quarter, unable to return. The Chiefs also had a missed 48-yard field goal, and the defense stopped the Chiefs from advancing after they recovered a fumbled punt by Adoree Jackson. The Titans also got the benefit of a quick whistle on the second blown two-point try. It looked like a fumble and the Chiefs could have run it back for two points, but officials blew the play dead.The Titans became only the third road team in NFL history to come back from at least 18 points down, and first since 1972. Their reward is a divisional round game next weekend against defending Super Bowl champions New England in Foxborough.